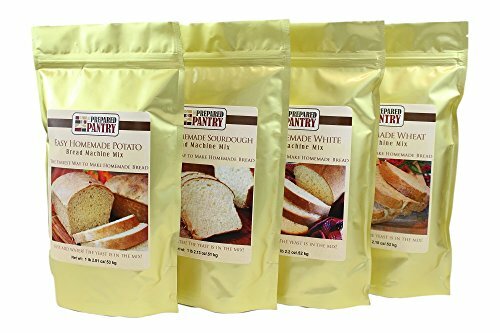 Looking for the best bread machine bread mix? You’ve come to the right place! If you’ve found this article, it means that you’ve probably bought a great bread machine not so long ago and the bread mix recipe that came with it wasn’t so good. The bread machine did not bake your loaf of bread as you wanted it to be. Hopefully you purchased one of the highest rated bread makers. Even if such a machine comes with instructions regarding the recipe of the bread mix, you could expect it not to be so effective every single time with the same mix. First of all, you might have to adjust the ingredients inside the machine because your dough might be either too dry or too wet – and this might happen even if you follow the recommended recipe! So, again, it’s no wonder you’ve searched for such a recipe. Let’s then cut the chatter and present to you some of the best bread mixes we have found while experiencing on our own and while scouting the filled-with-information web. Bread Mix or Bread Mix™? You probably already know what we’re referring to. Even before starting to think of, or search for the best ingredients you can use to create the perfect mix, you are presented with two options. Naturally, you can make your own mix, adding and removing certain ingredients by your liking, as well as buying the natural ones; or you could just buy a pre-made bread mix that comes with various ways to attract people, like special types of ingredients that are nut-free, soy-free and so on and so forth. Of course, what we recommend is that you make your own bread mix. First of all, by doing so, you’ll be able to find out the optimal bread mix quantity that can be put into your machine. Most of the commercialized bread mixes are made for the whole range of bread machines – and this is not necessarily a good thing. And, on top of it all, you can make what type of bread you want – vegan, gluten-free – while also making sure that the ingredients you use are what you actually look for. But, in the end, the choice remains yours – still, we assure you that you will get better results if you get used to using your own bread mix. Now that we’ve ruled out the types of mixes you can find out there, let’s move on to the actual bread mixes. We will describe one mix that we’ve found online and had pretty good reviews and then move on to another that we experienced with and found out it’s working good enough. Of course, the bread mixes we will present to you are just a base for the bread mix that you will be making. Feel free to play around these recipes and find the best for you and your bread machine. For the first mix, we’ll assume that you’ll be using a small bread machine (like this one) – you can adjust the ingredients accordingly, so don’t worry about the volume of the ingredients. You’ll start with 2/3 cups of lukewarm water. All of the ingredients should be kept at room temperature – however, when it comes to the liquids you are going to use in your bread mix, they should be at around 80 degrees F. The same applies for the ¼ cups of lukewarm milk. Then, you’ll need 2 tablespoons of butter and 2 and a half cups of all-purpose flour. Of course, you can choose to use special bread flour as it might yield better results – but you will experience with types of flour you like or prefer having in your bread and see which one fits your taste, and your machine the best. All that is left for this mix are the 5 teaspoons of sugar, the 1 ¼ teaspoons of salt and the one teaspoon of either instant or active dry yeast. The first few times, you should add the ingredients in the order they are specified by the bread machine’s manufacturer. However, if you think you might improve the way your bread is baked, you could change the order or the way of mixing – if your machine allows so. Now, for the next mix, we’ll start with one cup of warm water – which, in this case, has a recommended temperature of 110 degrees F, which is a bit higher than the usual of 80 degrees, but it shouldn’t cause any problems. However, if you end up with your bread having a mushroom shape, then it means that the water was too warm indeed and you should lower its temperature before starting to mix the ingredients. Then, you’ll have to add 2 tablespoons of white sugar, and one package of bread machine yeast. Yup, you can easily find a yeast that’s specially made for bread machines out there. Just be sure that it is one that fits your needs. Also, you will need ¼ cups of vegetable oil, one teaspoon of salt and 3 cups of bread flour. As you can see, for this mix, we recommend using bread flour, as the results are a little bit more satisfying. When it comes to the order you should add the ingredients in, you will first have to add the yeast, water, and sugar in the container of the machine. You will then idle for about 10 minutes while the yeast dissolves and foams. Before selecting your preferred setting, you will add the salt, oil, and flour to the now dissolved yeast. These are two of the best bread mixes we could come up with that will deliver what you need and are also basic ingredients. They’re not something too extraordinary and do not feature any additional ingredients – such as chips, flakes, chocolate bits, nuts and so on – but those are meant to be tested and added after a couple of trials. Of course, you can go wild and crazy with your bread mix after finding the one that fits your machine the best and that bakes a good, solid loaf of bread that you actually enjoy. Of course there’s nothing wrong with just buying your preferred bread mix. This one is one of our favorites! All you add is the water. The yeast is in the mix. Just got a gluten free bread machine for a Christmas present, can I use pre mixed gluten free bread mix in my machine, or do I have to make it from scratch. You can use any bread mix you like, either homemade or pre-made. There are a lot of great Gluten Free or Grain Free pre-made mixes available on Amazon.